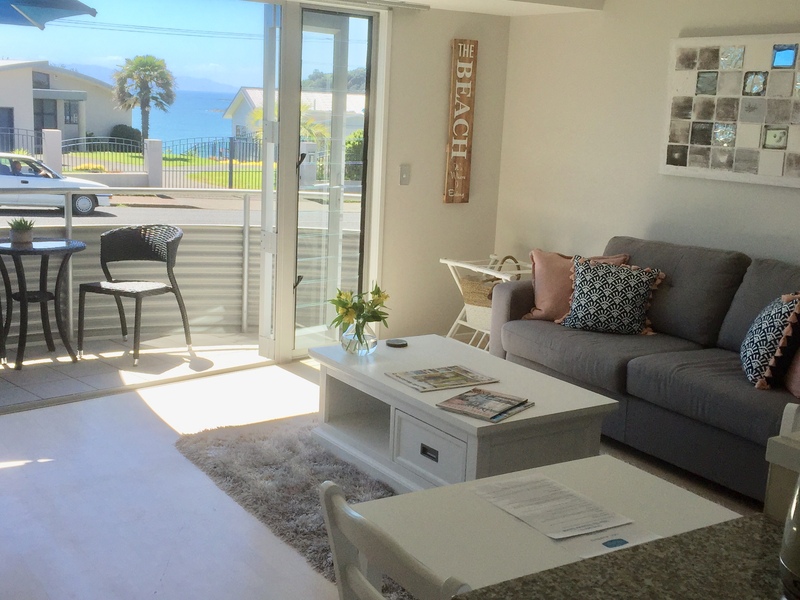 Both Villa Ten & Eleven are modern refurbished one bedroom apartments (side by side) in Oneroa Village. Situated on the upper level they both have partial views of Oneroa Bay and are metres from access path to Oneroa beach. Oneroa Village is the main township on Waiheke Island. You will discover restaurants, cafes, bars & specialty stores along with banks, the library, and our local cinema and theatre. The Villas capture the sun and with bi-fold doors that open out from the open plan living area to a deck, you can watch the world go by. Equipped with cooking facilities you can decide if its breakfast in or at one of the many restaurants less than 200 metres up the road. The kitchens featurs a full sized fridge freezers, combination microwave/oven, dishwasher, hobs, crockery & glassware of excellent standard. There is a combination washing machine & dryer (Villa Eleven) and washing machine (Villa Ten) along with iron, ironing board for and hair dryer guest use. Additonal Guests: Both Villas are designed to sleep 2 guests comfortably however on occasion can accommodate 2 extra guests in the lounge on a sofa bed. There is an additional cost of $30 NZD per person per night. Please enquire directly +64 9 372 9123 or email. Please Note: Standard exit cleaning and linen is included in the rate. Villas are only 2.0km from Matiatia Wharf (5 mins by Taxi) & 5.2km from Kennedy Point Car Ferry Wharf (7 mins by vehicle). Bus stops are outside Oneroa Bay Villa complex. Thank you so much for a wonderful stay! Excellent location, great views and very comfortable! Great location - enjoyed exploring beautiful Waiheke. Thanks for the chocs + flowers. Fan much appreciated!! Amazing place, we loved it. Everthings right here. choc was so yum, thank you. What a beautiful place, welcoming and very well catered! Thank you! A super convenient and well-appointed base for a visit to Waiheke. It's so handy being located right next to Oneroa's shops, restaurants and bars. The apartment has everything you need, a comfy bed and a peep of the sea to gaze at whilst sipping a [local] wine on the deck. Highly recommended! Fabulous place. I would definitely stay here again. Great location within walking distance to the beach & shops, very clean, bright and sunny. Tracy was also excellent to deal with. Had a lovely stay. Too short!! Great location and beautiful accommodation. We will be back!!! Easy painless check in, lovely little touches round apartment, great location.